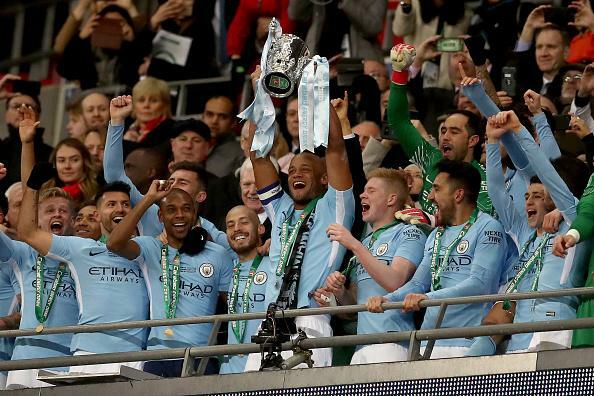 Manchester City last evening stormed to their first title win of the season, emerging victorious over Arsenal at Wembley Stadium. The Citizens were recently dumped out of the FA Cup by League One side Wigan Athletic in one of the biggest shocks of the season. However, they were able to bounce back with style, earning a comfortable 3-0 win over the Gunners. Star striker Sergio Aguero opened the scoring after just 18 minutes. Incredibly, it was goalkeeper Claudio Bravo who provided the assist. The Chilean international did so by passing the ball straight to Aguero from inside his area. 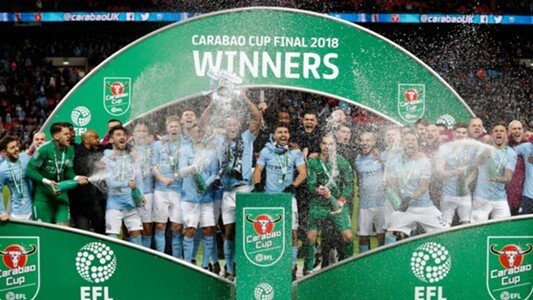 Club captain Vincent Kompany then added a second goal in the 58th minute, assisted by Ilkay Gundogan who glided the ball into the path of the Belgian international. The final goal of the game came in the 65th minute, with David Silva finishing off the scoring with a fine finish from inside the box. Will They Win The Treble? As it stands, Pep Guardiola’s side pretty much have one hand on the title already. They are currently enjoying a 13 point lead over their city neighbours Manchester United. Although, the Citizens do have a game in hand on their rivals. Outside of domestic football, Manchester City comfortably beat Swiss side FC Basel in the first leg of their last sixteen UEFA Champion’s League tie. It looks highly unlikely that they will let a 4 goal lead slip, especially as the second leg will be played at the Etihad. For that reason, 2018 might just be the year that they finally make their mark in Europe. With City’s first title of the season now wrapped up, City will now set their sights on clinching their 3rd Premier League title. Not only that, they remain in contention to win the UEFA Champion’s League too. Although, if Spanish giants Barcelona have anything to say about it, it certainly won’t be an easy task! Let us know what you think in the comments section below or on Facebook, Twitter, or Instagram.